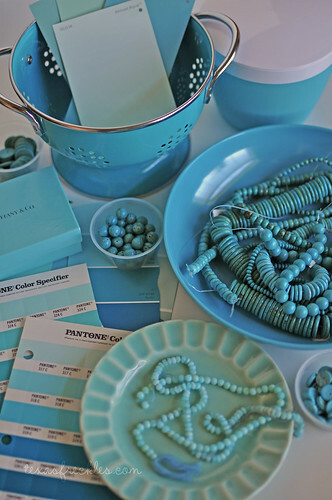 I've always loved a beautiful robin's egg blue or dreamy Tiffany blue, but it seems that right now, turquoise is everywhere! Inspired by House of Turquoise, I decided I want to paint my kitchen island in the new house, turquoise. I didn't have any trouble convincing the hubby either. I've been trying to pick a paint color for the sewing room, so Shea and I went paint color shopping. Now she wants to paint her bathroom turquoise and I want to paint the laundry room turquoise. Never too much turquoise! We have it in both our living room and dining room. And the reason you're seeing it everywhere? Pantone picked it as colour of the year. Just like the lime green we saw everywhere a few years back. Can't blame you for choosing Turquoise. It is such a tranquil color. Reminds me of the waters in paradise. I need to find colors I like for my home.... This is a great one. Loved the post, Melanie. What a pretty selection of things. Turquoise throughout the house sounds good to me. You've got me looking around thinking "you know, I haven't painted anything in a while...."
Turquoise is a lovely color. I've been using it for a bit of POP in some of my stitching. But, that's what I think that color is good for; not for the whole house. Sorry to disagree with everyone. A woman after my own heart! I love that color, always have. It reminds me of the 30's. I really love that little plate in your photo! How fun is that? How FUN! Please show a picture of the finished project!!! Just today my kids and I looked at millions of paint chips...to use for some paper crafts though. My daughter did pick a pretty aqua she would like for her room after our next move. It sure is fun reading all those funny, yummy and unique names they have for all those colors. Good luck to ya. just go ahead and paint...!!! guess, what i am doing soon?! That's so funny! I am trying to pick a color for my sewing room and a cabinet/shelf too. I love greens, so I was thinking either aqua & lime on the wall & cabinet to coordinate. I always go safe with a white or something...trying to step out too. I love the turquoises! Never! There is something so relaxing about it! I love the mix with red so it is a match made in heaven. I would love to see your aqua goodies. Actually...my craft/laundry room will become a Behr "Refreshing Pool" color this weekend! I just bought a condo and am so sick of neutrals that I am considering painting my living room, dining room, and hallway (the majority of the house besides the master bedroom) oceanside paradise by Kelly Moore. However it is pretty bright and I love the color, but it terrifies me in such a big area. Please help. What does everyone think? My hubby is not interested in an accent wall, so it is all or nothing. And if I do this, what colors do I paint the rest of the house? I was thinking a pale orange for the kicthen, but have no clue for the master bedroom? all of that turquoise looks great! i don't think it'll be too much! i think if you do different color accents in each room it will give each room its own feel without looking too similar. When i was teaching in Arizona, turquoise was everywhere too- Some of the complementary colors I saw with the turquoise really made it pop! Have you thought of pairing it with silver or "Coral" red? The Navajo people I worked with had turquoise and coral necklaces which are just beautiful! I also love turquoise. IT looks great with a warm lime green! Paint the lime green on the walls and all that other stuff turq will just POP!